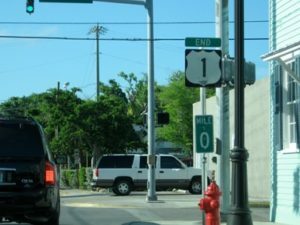 A brief History of US Route 1, America’s first interstate highway. U.S. Route 1 is a major north–south U.S. Highway that serves the East Coast of the United States. It runs 2,390 miles (3,846 km) from Key West, Florida, north to Fort Kent, Maine, at the Canadian border. U.S. 1 generally parallels Interstate 95, though it is significantly farther west (inland) between Jacksonville, Florida and Petersburg Virginia. The direct predecessor to US 1 was the Atlantic Highway, an auto trail established in 1911 as the Quebec-Miami International Highway. In 1915 it was renamed the Atlantic Highway, and the northern terminus was changed to Calais, Maine. Due to the overlapping of auto trail designations, portions of the route had other names that remain in common use, such as the Boston Post Road between Boston and New York, the Lincoln Highway between New York and Philadelphia, Baltimore Pike between Philadelphia and Baltimore and the Dixie Highway in and south of eastern Georgia. North of Augusta, Georgia, the highway generally followed the Fall Line, rather than a more easterly route through the swamps of the Atlantic Coast Plain. Brickell Avenue is the name given to the stretch of U.S. Route 1 in Miami, Florida just south of the Miami River. When the New England road marking system was established in 1922, the Atlantic Highway within New England was signed as Route 1, with a Route 24 continuing north to Madawaska; New York extended the number to New York City in 1924 with its own Route 1. Other states adopted their own systems of numbering, and by 1926 all states but Maryland had signed the Atlantic Highway as various routes, usually changing numbers at the state line. In 1925, the Joint Board on Interstate Highways created a preliminary list of interstate routes to be marked by the states,including Route 1 along the Atlantic. This highway began at Fort Kent, Maine and followed the existing Route 24 to Houlton and Route 15 to Bangor, beyond which it generally followed the Atlantic Highway to Miami. In all states but Georgia that had numbered their state highways, Route 1 followed only one or two numbers across the state. The only significant deviation from the Atlantic Highway was between Augusta, Georgia and Jacksonville, Florida, where Route 1 was assigned to a more inland route, rather than following the Atlantic Highway via Savannah. 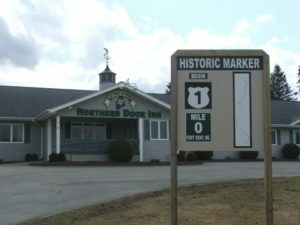 One of the many changes made to the system before the final numbering was adopted in 1926 involved US 1 in Maine. The 1925 plan had assigned Route 1 to the shorter inland route (Route 15) between Houlton and Bangor, while Route 2 followed the longer coastal route via Calais. In the system as adopted in 1926, US 2 instead took the inland route, while US 1 followed the coast, absorbing all of the former Routes 24 and 1 in New England. Many local and regional relocations, often onto parallel superhighways, were made in the early days of US 1; this included the four-lane divided Route 25 in New Jersey, completed in 1932 with the opening of the Pulaski Skyway, and a bypass of Bangor involving the Waldo-Hancock bridge, opened in 1931. 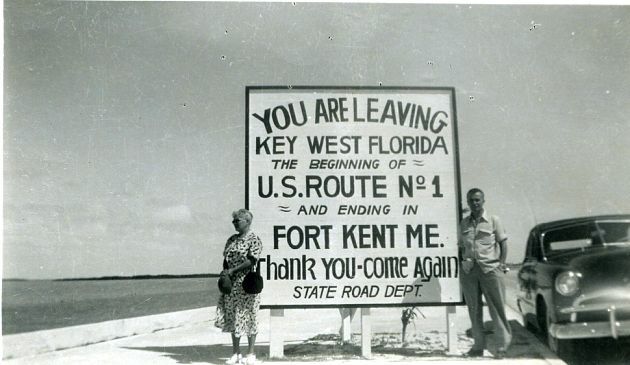 The Overseas Highway from Miami to Key West was completed in 1938, and soon became a southern extension of US 1. Fort Kent residents Alphosine and Roland Page in Key West circa 1952. 1950’s vintage Route 1 sign which was located about one mile east of the current hospital location. 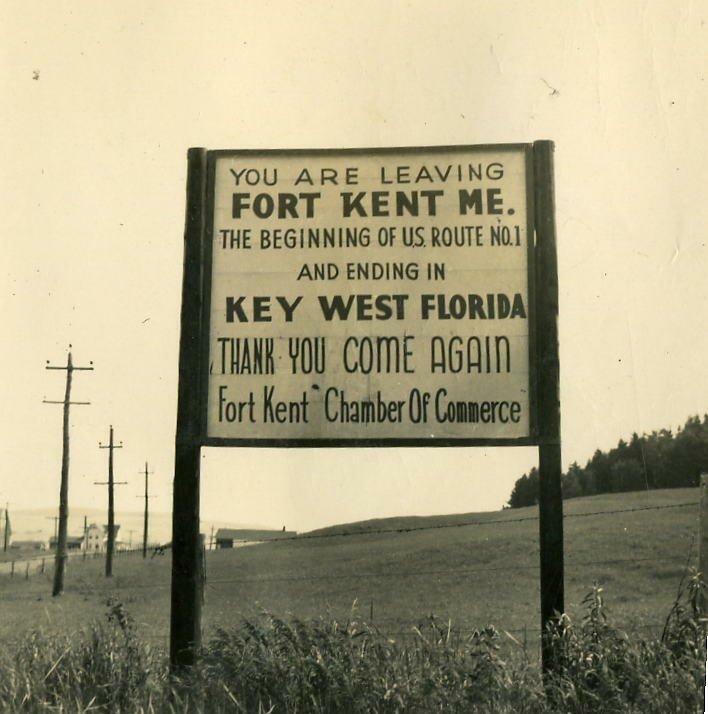 Note that in the 1950’s Fort Kent and Key West both claim to be the “beginning”.